The two things I am in love with right now are skirts and well all things Couture. 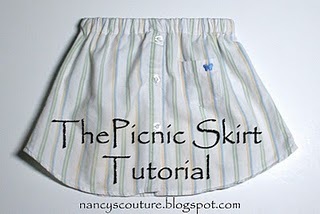 So I am very happy to present you with Nancy from Nancy's Couture and her tutorial on the Picnic Skirt from a button down shirt. #1. I signed up for Spring destash because it's time to use up some of the fabric I have had around for a few years now. I have been eyeing some new fabrics but I really don't have room to store anymore fabric until I use up some of what I have. I also like a good challenge and I believe this will make me be even more creative! #2. My favorite upcycling projects are using t-shirts to make dress for my little girl. I love that every single dress is completely unique. And you can whip one up in less than an hour. I also being able to take something that doesn't fit my kids any more and altering it to make it last longer. #3 There are many wonderful upcycling patterns. What better way to celebrate Earth Day than by wearing something you have upcycled! I hope to share some upcycled things with a few special friends on Earth Day. 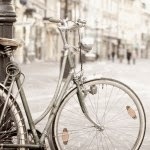 #4 Why do I blog? I recently asked myself this question. I love that I can share my love of sewing with other people who love to sew. I want my blog to inspire others to share their love and talent of sewing with others. Whether it's to teach someone to sew or to sew something that someone needs. I recently was able to participate and help spread the word about to little girls who were in need of kimono style tops to wear after their heart surgeries. It was a great joy for me to particiapte!!! #5 I find inspiration every where. Some of my inspirations are God, my kids, things out of necessity, magazines, and other blogs. #6 I am a stay at home Mommy to a 3 year old little girl and a 5 year old boy. I am currently teaching my son how to sew. And he is doing amazing! I have started a new series on my blog called "Make A Difference Monday". I post about different things you can sew to help others. I have posted about the need for Kimono shirts for the little girls having heart surgery, an auction to raise money for a transplant for a little boy, etc. If you know of anyone who is in need of something, anything, that can be sewn please send me an email so I can get the word out. I really want to be able to help others through my talent.